One of the reasons why many Java developers are not aware of Spring certification was the steep cost of spring certification. Earlier it was exclusively for developers who enroll in the expensive classroom on online Spring course from Pivotal. The cost of those training was quite expensive, if you to pay from your pocket e.g. it will cost you around 3200 USD if you take these training in the USA, North America or Europe and somewhere around 50,000 INR depending upon which training you take in India. If you compare this to Java certification, which cost around 246USD, it's very expensive and because of that steep cost of Spring certification, many Java developer, who use Spring certification were not keen to get certified, but things have changed now. From 10th May 2017, it's not mandatory to take Spring training for getting Spring certified. You can directly purchase the exam voucher which cost around 200 USD from the Pivotal website and appears in the exam. If you pass, you will become a Pivotal certified Spring developer. The spring certification exam is a computer-based exam and there total 50 questions in the exam and you will get 90 minutes to answer them. Passing score is 76% which means you need to answer 38 out of 50 questions correctly, that's quite high from many certifications. But the good thing is you are not required to write code, which means time is more than enough to solve those questions. They mainly test your core concepts. In order to prepare for spring certification using self-study, you need a good study guide and a good exam simulator. In last a couple of articles, I have shared some of the best study guides for Spring certification and today I'll share some of the best Spring mock exams which are freely available on the internet for practice. Here is my collection of some of the best Spring Core Professional Certification dumps and online practice tests which are freely available. This is one of the best free Spring mock exam available online. It contains 10 questions, which you take online in a time-based test or you can download PDF for offline reading. It will give you a good idea about the difficulty level of questions you can expect in the real exam. To be honest, there are not many free practice tests available for Spring certifications. Those few which are available also doesn't have enough question for practice, hence if you are serious about Spring certification, I suggest you buy the full version of this exam which contains 200 high-quality questions for Spring certification. You can also find the answers for all question at the end of the PDF document. If you are thinking about how to prepare for this topic, well, there is no single course or book. You need to take help from a couple of sources like Spring Framework 5: Beginner to Guru covers most of this topic. To prepare REST and Spring Security in depth, I suggest you check fellow blogger Eugen Paraschive's Learn Spring Security: The Certification Class and REST with Spring Certification class courses, both are excellent not just for certification but for in general experience and knowledge required for a professional job. Vojtech Ruzicka's has shared some useful tips, notes, and practice questions for both Spring core and Spring web exams. If you are preparing for Pivotal Certified Spring Professional then his practice questions are immensely useful. He has also created a set of flashcards using Anki software. The questions are basically derived from his Spring core study notes. Anki provides desktop client as well as mobile applications to study on the go. Once you download his deck of exam questions, you can use it on desktop or mobile at your convenience. The deck contains close to 200 questions and you can import the deck in Anki using File → Import. 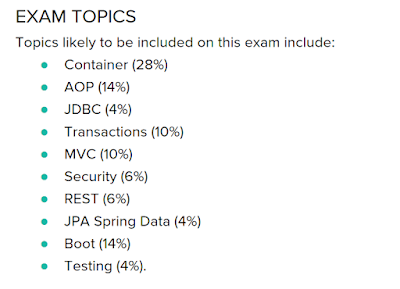 Mock questions to prepare the Core Spring 3.x Certification : free 50 multiple-choice questions / 88 minutes / passing score = 76 % (38 questions answered successfully). You can download the PDF of these Spring questions from this link. Even though the questions for Spring 3.0 certification, it's still useful and you can give it to check your knowledge and understanding of core spring framework. This is the online version of the previous mock exam. If you want to give a test online you can also take this test on Skill guru website, it's available there. Though, you need to register at Skillguru website before you can take this practice test online. 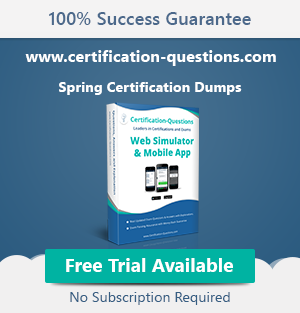 That's all about some of the best Spring certification practice tests which are freely available on the web. If you are a Java programmer preparing for Spring certification then I have shared some of the most useful resources to help you in your preparation in this blog. The list includes Spring certification notes for both Spring core and Spring Web certifications, Spring mock exams, free Spring Certification dumps, books for Spring certifications and official Spring certification guides. You can check them in your free time. Does Spring certification help in Job and Career? P.S. - If you are an experienced Java developer and using Spring framework for 3 to 5 years and want to get certified for your skill I suggest you go through David Mayer's Online Spring Mock test, It's a free test and if you can score over 80% then you are ready for the real exam.